Where will Derek Rivers fit on defense? The Patriots may have traded down multiple times at the top of the 2017 draft, but when they finally decided to make a pick it was hailed as a steal. 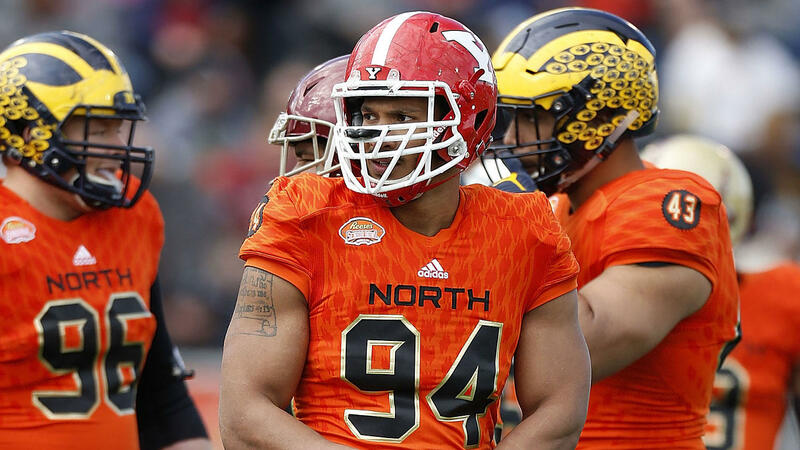 With the 83rd selection, New England took Derek Rivers, a tantalizing young edge defender. There's just one question: where will he play? While Rivers played defensive end at tiny Youngstown State (FCS), he most likely won't be able to remain there as a pro, at least initially. His 6'4" frame is built for the NFL but at under 250 pounds, he'd have to pack on some size before he could be an every-down DE. Complicating matters somewhat is the Patriots' hybrid defensive scheme. They could nominally be called a 4-3 club, but New England runs a fair amount of looks out of a 3-4. With maybe an additional 25 pounds of size, he could be a starting 4-3 end who contributes as a pass-rusher--but to get after the QB in a 3-4, he'd have to remain at his current weight and stand up as a Von Miller-esque linebacker. Thankfully, Rivers is so athletically gifted he could go either way. He ran a 4.61 40 and a 6.94 3-cone drill, both tops among linebackers at the combine. His strength and explosiveness were well documented with the Penguins, and he backed that perception up with 30 bench press reps and a 35-inch vertical as well (both the #1 scores as well). Whether or not he immediately settles in at one spot or the other, he should be able to make an instant impact as a situational pass-rusher. His eventual destiny will depend on his performance in games, but so far I would put my money on him ending up at linebacker. While it might mean he can't always take advantage of his pass-rushing skills, asking him to gain so much weight places his natural gifts in jeopardy--and there's no guarantee it will help him improve against the run, one of his occasional weaknesses in college. He'll have to learn to get more comfortable in coverage, but that's a far easier adjustment for a superb athlete (just being asked to play linebacker) than learning how to properly play in the trenches at an NFL level.